Place cake on cutting board; cut into pieces as shown in diagram. Arrange on cake board or platter as shown in diagram to resemble a race car. Tint whipped topping with food colouring; spread evenly over cake. 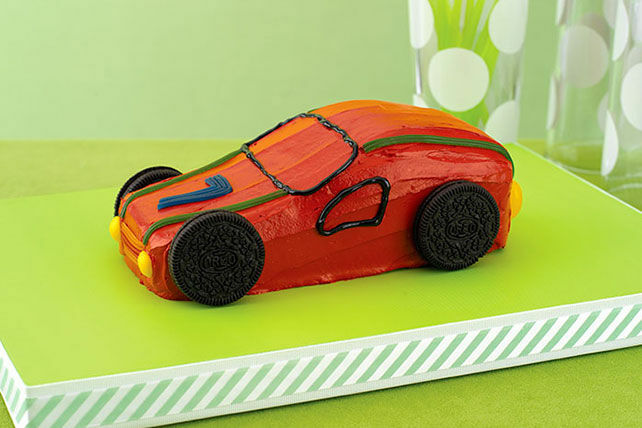 Cut four 1/2-inch-wide strips from fruit roll square; arrange on top of cake for the "racing stripes." Place remaining large piece of fruit roll in front of the "car" for the "grill." Place 2 Oreo Cookies on each side of "car" for the "wheels." Place yellow chocolate pieces on front of car to resemble headlights and red chocolate pieces on back of car to resemble taillights. Draw windows on car and write the child's age on top of cake with icing. Use remaining icing to decorate cake as desired. Refrigerate until ready to serve. Place Teddy Grahams Cookie in the "driver's seat" just before serving. Store leftover cake in refrigerator. To make three individual cakes instead of one large cake, use 1 pkg. (397 g) miniature pound cakes. Prepare as directed, substituting 12 Mini Oreo Cookies for the 4 Oreo Cookies and using 3 Teddy Grahams Cookies. Make a "track" out of construction paper or bristol board. Arrange the iced cakes around the track. Place decorations in small bowls and let each child decorate one of the cars! Makes 3 cakes or 12 servings, 1/3 of a cake each.